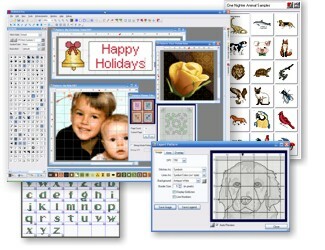 PCStitch Pro is the advanced version of PCStitch, but it is not just for professional designers. If you're looking to extend your crafting creativity, we invite you to take a look at the ultimate design software available today. We started with the things folks liked about PCStitch and added features for the more demanding crafter. Want to create your own stitched fonts or custom stitches? Do you want extended export capabilities? How about extending the capabilities of your printouts? If you like PCStitch, but are looking for more, we think PCStitch Pro is for you! Download it today and check it out! PCStitch Pro Now on Sale! For a limited time, you can get PCStitch Pro for only $49.95! This is more than 35% off the regular price of $79.95! Click Here to place your order now! Start with Everything Standard: The professional version includes all the features of standard including Importing as well as using Text, Borders, Custom Stitches, and Libraries. Click Here to evaluate PCStitch Pro on your own computer! Palette Symbol Enhancments: Select custom symbol colors for printouts. Choose symbol by stitch type. Specialty Stitches: Use over 60 speciality stitches such as the Lazy Daisy. And Much, Much More... Download PCStitch now and see all it has to offer!